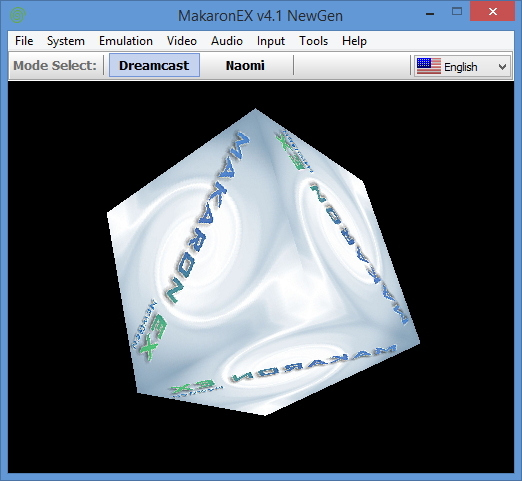 Makaron V4.1 is another popular Dreamcast emulator. While we’ve had better results with Demul, this emulator does run some games slightly better than it’s rival, so it’s nice to have an alternative. If you want to try the emulator or play a game that doesn’t work with Demul, follow the instructions in this tutorial to get started. First of all, we need to download the emulator. You can do that by visiting this page. Sadly it seems, just like Demul, that MakaronEX hasn’t been updated since 2013, but it still works well so don’t concern yourself with that. The emulator downloads as a .7z file. You will need to extract the files from this archive to any convenient location on your PC. 7z files are similar to Zip files, but Windows does not support them without extra software. If you’re not familiar with dealing with .7z files, we recommend you follow these simple tutorials for 7-zip, a free tool that can open .7z files. Once you’ve managed to extract the files, the next step is to install the emulator. You do that by simply running the executable file that you got from inside the .7z archive. Follow the on-screen prompts and install the emulator to any convenient location. Note that if you are using Windows Defender as your antivirus, it will flag one of the files within the zip archive as having a virus. We firmly believe that this is actually a false positive, but if you are concerned you can simply quarantine the file as it is only needed if you want to emulate the Naomi arcade board. The next step is to copy your Makaron compatible Dreamcast BIOS images. Unfortunately these files are under copyright so we can’t link to them directly, but the files you need are named as follows. If you’re familiar with file hashing tools, you can check that the files are the correct ones by comparing the MD5 hash numbers we’ve provided too. In addition, you may also need the following files. Once you have obtained these files, browse to your MakaronEX installation directory. Open the “Dreamcast” sub-folder then create a sub-folder called “rom” (if it doesn’t exist already) then copy the files into there. With that step complete, you can start the emulator for the first time. To do that, simply search for MakaronEX from the Start menu or Start screen. The following window should then appear. 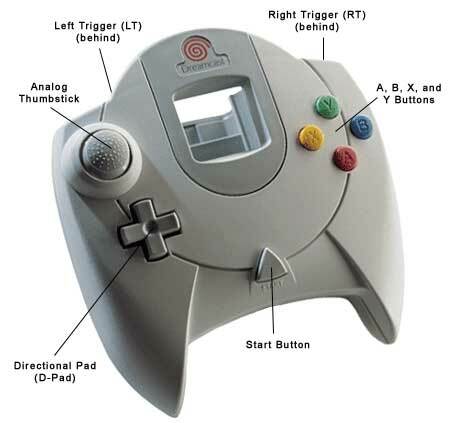 As with Demul, the emulator supports Dreamcast games as well as Naomi arcade games, but we’ll only be covering Dreamcast games in this tutorial. There are less options to configure with this emulator compared to Demul. Most options can simply be left at the defaults. We’ll start with the video options, open the Video menu and you will see the following options. Resolution – Resolution is the number of pixels in each dimension that can be displayed. The more pixels you have, the sharper and better defined the image will be. The Dreamcast had a resolution of 640×480, but of course modern PCs can go well above this. The higher you set this setting, the better things will look, but higher settings put more demand on your computers processor. Like Demul, Makaron seems to have the strange bug that caused a 4:3 image to be squashed too much. Note – If the emulator seems to ignore this setting, you will need to change your Windows desktop resolution instead. the emulator should then copy whatever resolution you have set Windows to. Render Mode – Choose between Native and High Resolution, source and scaled (or stretch). This is like the Internal resolution setting in Demul. High resolution can significantly increase the visual quality of the games, but it also significantly increases the load on your computers CPU too. Users with fast PCs should use High Resolution while those of you with more modest machines should choose Native. As for Source and Scaled (or Stretch), these settings affect the aspect ratio. By choosing Source, the game should render in the correct (non-stretched) aspect ratio, while Scaled and Stretch will stretch the image to fill the screen, usually distorting the graphics in the process. That’s the theory at least, but it doesn’t always work like that. See the link above for possible workarounds if you cannot get your emulated image to look right. Advanced – Trilinear filtering – A technique that smooths the appearance of textures. Can be turned on in most instances without unduly affecting emulation speed. Advanced – Anisotropy Level – Anisotropic filtering is a method of enhancing the image quality of textures on surfaces of computer graphics that are at oblique viewing angles. The higher you turn this setting the better textures will potentially look, but the more processing power the emulator will require. Faster computers should manage 8 or even 16 pass filtering without too much trouble. Advanced – Shaders – These are optional effects that change the appearance of the image. “FXAA” (fast approximate anti-aliasing) in particular can improve the image quality. With the video settings configured, let’s take a look at the Input menu. You will notice that you can only configure the 1 Player Interface and 2 Player Interface, sadly it seems like this emulator only supports up to two players. Under 1 or 2 player interface you have the following options. X-Input Pad – Use an Xbox 360 controller. This is configured for you automatically. Keyboard – Use the keyboard to emulate a controller. D-Input Pad – Use an older, DirectInput compatible controller. Wrapper – Honestly we’re not sure what this option is for or how to use it, so we’ll skip over that for now. When you choose Keyboard or D-Input pad, you will need to configure the controls appropriately. For a Direct Input pad, for instance, open the “Input” menu and then choose “Configuration”. The window shown below will then appear. 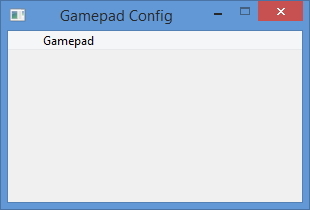 We’re not sure what the point of this little window is, but all you need to do is click on “Gamepad” and the window shown below will appear. When you’re done configuring your controller, click on “OK”. 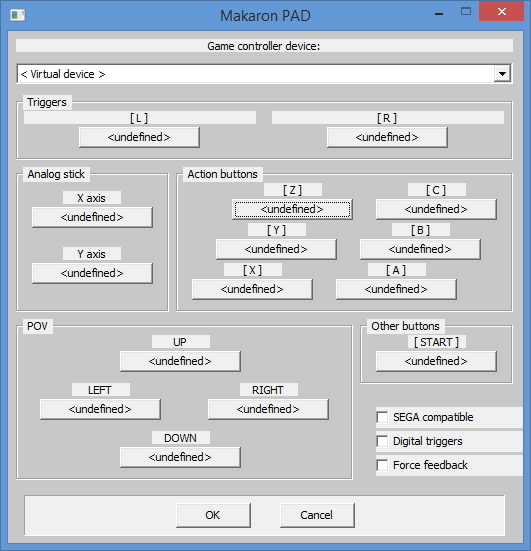 Close the Gamepad configuration window to go back to Makaron. With our basic settings all set, we can go ahead and start the emulator. To do so, open the “File” menu and choose “Open Image”. You now simply need to browse to where you stored your Dreamcast game image file, select it then click “Open”. Emulation should then start automatically. When you’re done playing your game, press Alt and F4 together to quit. We haven’t exhaustively covered all options available in this emulator. There are a number of options under “Emulation” that can be tweaked to gain extra performance, for instance. However, our focus on the site will be on Demul, which runs most games better than Makaron. We may expand these tutorials in the future, but for now you should have everything you need to get started. Screw you! Avast Antivirus detects trojan! Hello, i have a problem with Crazy Taxi for naomi on this emulator, even configuring the keyboard in a thousand ways this partially responds (the car does not walk). Another problem happens with Dynamite Cops for DC which gives me a black screen.